If you are a fiction author – established or aspiring, for stage, page or screen – you probably spend a great deal of time thinking about your characters and working out the details of your plot. Writing – finding the right words to formulate what you want to express. Whatever you call it – for instance style or voice – it has to do with language. Storytelling – constructing coherent narratives that have an emotional effect on the readers or audience. Whatever you call it – outlining, plotting, story development, dramaturgy – it has to do with structure. So, apart from language, stories have plots and characters. Creating plots and characters is a craft. Beemgee is a tool for this craft – for structuring narratives and developing characters. Without a strong plot driven by fascinating characters, even the best writing can’t save the story. Motivated characters lead to compelling plot structure. A strong plot creates emotional engagement in the audience. A satisfied audience spreads the word, creating a wider audience. That’s why story development is such an important process. It’s probably natural for you to use a word processor to write. Now you’ve found an online tool specifically designed to help you develop your material. Beemgee is where you structure your narrative and compose your story. It is a comprehensive toolkit for narrative structure, perfect for fiction and also memoirs or even narrative documentary. 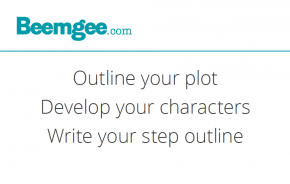 With Beemgee you outline compelling plots and create memorable characters. Beemgee focuses on dramaturgy and composition and is designed to help you get to grips with everything from subplots to character transformation, from logline to step outline. Beemgee is not a text editor or writing app – authors type their stories elsewhere, using what they have developed in Beemgee as a basis for the text. There is a craft to storytelling. Much of that craft has to do with the structure of the story, the composition of its narrative. Much as an architect designs the plans of a building before the first bricks are laid, or a composer writes the music before it can be played, many authors plan the story composition first before filling the first page with text. The process of planning how the story is structured is known as outlining. There are significant benefits to outlining. For one thing, going through this process usually entails fewer rewrites later. When the author knows the direction of the storyline(s), it is easier to keep all the threads under control while writing. Without this direction, there is a danger of losing the plot half way through. Authors use Beemgee to structure stories they are conceiving – to outline them before writing them. Publishers, editors or film and TV producers use Beemgee to examine and work on the structure of stories already written, for instance to evaluate or improve early drafts. Academics and narratologists use the tool for comparative analysis of the narrative structure of films, novels or other narratives. Outlining does not concern only the plot. It includes determining the motivations of the characters. Stories have characters. All of them do. Authors devise characters, just like they devise plots. Often, the act of composing a story cannot be easily separated into structuring plot and developing characters. Indeed, why would any author want to? Characters arise out of plot ideas as much as plot ideas arise out of characters. The Beemgee Character-Builder is designed to help you determine the narrative function of the characters in your story. By honing or sharpening the essential dramatic function of the major characters in the narrative, an author is at the same time honing and sharpening the plot. Simply using Beemgee raises authors’ awareness of dramaturgy. If storytelling concepts or features of the tool are unclear, context-sensitive advice is available anywhere in the tool with the | ? | button. The in-app help gives quick guidance. MORE ABOUT buttons leads to in-depth articles containing techniques, tips and a wealth of background information. Beemgee will give you pointers, without ever being prescriptive. In our Beemgee blog you’ll find many articles on structure in storytelling and narrative that relate directly to the functions and features of our author tool. Beyond that, our blog provides insight into the world of storytelling and plenty of advice about how to create emotionally engaging stories.